"I was hoping that coming here would spark the kind of turning point you'd see in a movie." In Shibuya Goldfish, Giant goldfish have descended upon Shibuya and are devouring people left and right. It sounds right out of a movie, something our aspiring filmmaker protagonist Hajime Tsukiyoda can’t help but notice. Unfortunately for our young film buff, it’s anything but a movie as he’s trapped amongst survivors in a shopping district. The story starts with Hajime wandering around Shibuya, contemplating how he has ended up in his least favorite place. He’s annoyed at the people, the culture, and the very atmosphere. Without much wait or buildup, the fish appear. Monstrous, bloated, and dead-eyed. Attacks proceed, as both friendly faces and complete strangers are consumed by the giant goldfish, who utter terrifyingly nonsensical human phrases. Soon, all of Shibuya is barricaded off within a giant fishbowl, and everyone trapped inside is isolated from the rest of Tokyo. Volume 1 is spent in a shopping mall in Shibuya with a rag-tag group of survivors, including Hajime. We watch in horror not only at the monstrous fish eating the masses, but also at the brutal choices the survivors are forced to make. Shibuyshiba Goldfish is a seemingly fun, eerie manga written by Hiroumi Aoi just in time to cure midsummer blues. It’s almost reminiscent of another creepy manga; Gyo, by the legendary Junji Ito. While at face value they seem similar enough to be sufficiently spooky, it feels like something else might be lurking underneath the water. 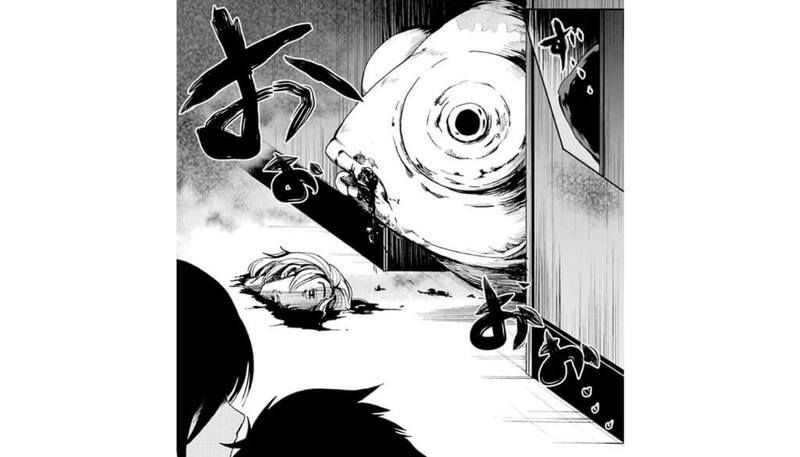 So does Shibuya Goldfish stack up as a great horror manga? Or does it scale back a little too much? I’ve always been a huge fan of Junji Ito, with some of his works being the first manga I ever dove into. The cover of Shibuya Goldfish seemed to leap into my arms and I immediately thought of Ito’s Gyo. The best parts of horror are the most mundane, normal things (only corrupted). Sometimes it’s a doll, other times it’s a clown, or maybe even a giant goldfish. It’s this idea that the things around us every day, innocent or even child-like, can be the cause of fear and downfall. It’s compelling, and it’s been driving horror for centuries. 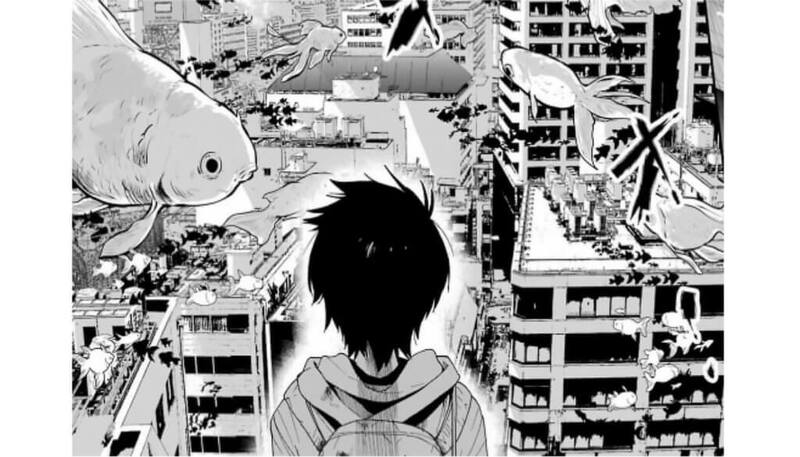 What’s so poignant here with Shibuya Goldfish is that it’s essentially a zombie-genre read. It features a group of survivors doing whatever it takes in a mad dash for existence. The district of Shibuya itself features a key makeover from, “the town of youth,” to a sci-fi apocalyptic outlier separated by little more than a glass bubble. Even the fish themselves remind us of zombies; lifeless, glassy eyes, and (seemingly) driven by nothing more than a biological, unholy appetite. They don’t seem to be particularly smart or resourceful. They’re just there, and they want to eat. They simply swim through the air, giving the Shibuya fishbowl an even eerier appearance. Giant, killer goldfish swarming a technicolor world in the bloodiest way possible? What’s not to love? Well, as it turns out, a lot. The biggest let down of Shibuya Goldfish is the writing itself. It seems to dance quite a bit around the line of taking itself too seriously and setting itself up as campy as possible. Ironic tropes are used far too often, while falling into predictable plot points. Our poor characters seem to suffer from little-to-no characterization, including Hajime. The characterization that we do receive is unfortunate, as it relies too heavily on the most obvious things, such as a tsundere Idol or the cruel popular girl. Every character can fall into a trope that we’ve seen repeatedly, not only through manga and anime, but almost every other medium as well. With very sparse character building, the emotion and sadness that we are supposed to be feeling for our cast doesn’t exist. It’s near impossible to feel for them because we simply do not know them. There’s no chance of becoming invested in the story or the characters; we instead just see blood, guts, and the occasional deep-felt monologue from Hajime. The manga also seems to push back against the horror itself, relying too heavily on the gore and gross-out factor instead of moments of actual dread and terror. While the concept of killer goldfish might seem like a heavy task to convey, it can be done. They can be terrifying and induce fear. It’s a shame that we don’t see that here. The art almost seems misleading; it’s nothing new or innovative, but it gets the job done. Seeing the lifeless, indifferent eyes of the fish hovering as someone disappears into their mouth should be spooky, but again we’re left wanting for more as the writing lets the story down. However, the world-building is quite refreshing. You can feel the hustle and bustle of Shibuya, but that’s not enough to save interest throughout the pages. Shibuya Goldfish Vol. 1 was a quick read, one that maybe took me two hours. The focus seems lacking when it comes to the story itself, and instead places emphasis on trying to shock us more. I’m almost surprised the panels didn’t just scream “LOOK AT HOW WEIRD AND GROSS THIS IS!” instead. But it wasn’t all completely bad. Like I said, it was a quick read and the idea is truly a fun one. The giant, terrifying goldfish are almost refreshing in a way, shifting the focus on current manga from ‘adorable’ monsters to ‘that’s right, they can be scary too’ monsters. It almost feels like if the manga had leaned farther into one direction it would be more cohesive. Maybe if it was more campy and kitschy, or maybe if it was more old-school horror. Regardless, it left me indifferent as to whether or not Hajime and the band of survivors make it through Shibuya, or if they continue to descend into chaos. Maybe I’ll go read Gyo again. If you want more info about “Shibuya Goldfish” you can find it at Anime Planet. You can also order the first volume on Yen Press’ website. This series definitely has a very interesting concept. I never imagined goldfish as the subject of a horror series, but this definitely makes me want to give the story a try. It’s a little disappointing to see that the writing didn’t live up to the potential that the concept created, but I think I would be able to get through it, just because I can’t pass up a series with such a unique idea for presenting horror. If you’re ever looking for more interesting horror series, A Compendium of Ghosts is one that you might like. It also has a pretty unique spin, with the series focusing on ancient Korea in a village where ghosts, monsters and creatures from Korean folklore lurk. The art style was also drawn to mimic the style of scroll art, and I think it really adds a lot of dimension onto the story. I highly recommend giving it a try if you have the time!